Eddie Grenfell, who has led the Arctic Medal campaign. THE Foreign Office has blocked plans by the Russian government to honour Arctic Convoy veterans with a medal for valour. As previously reported, the Russian Embassy wrote to the survivors of the harrowing Second World War campaign telling them it intends to give them the Medal of Ushakov for their heroic role. The convoys kept Russia supplied to keep fighting the Nazis on Germany’s eastern front, and have been credited with ensuring Hitler did not triumph. But while the Ushakov medal has been handed to veterans from Australia, Canada and the United States for their role in the convoys, the British government is refusing to allow it to be given to British veterans. 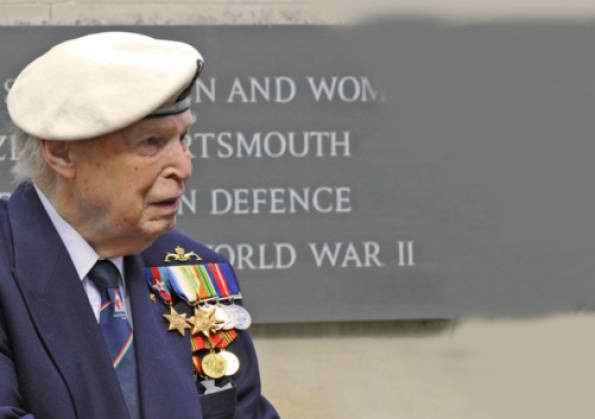 Commander Eddie Grenfell, 92, of Portsea, has been leading a 15-year campaign to get a campaign medal struck by the UK in recognition for sacrifices of the veterans. They are angry that, despite a promise in opposition to grant a medal when next in power, the Conservative party has so far not done so. Of this latest blow he said: ‘I cannot believe the Foreign Office, William Hague, is doing this. This is not a campaign medal, this is a medal for valour. He’s saying that what we did out there, what we went through, had no valour at all. Earlier this year, ambassador of the Russian Federation, Alexander Yakovenko, said: ‘We are offering the Medal of Ushakov. For us, it’s an important part of our history. Under UK law, citizens are allowed to receive foreign medals and awards only if the British government gives them permission, and only if the award relates to the recipient’s activities within past five years. A spokesman for the Foreign Office said: ‘The rules on the acceptance of foreign awards state that for permission to be given for an award to be accepted, there has to have been specific service to the country concerned and that that service should have taken place within the previous five years. Portsmouth South MP Mike Hancock said: ‘It is absolutely ridiculous and shameless. This country can’t even give them the medal but we can stop them from getting a medal from the people they went to help. It’s an absolute disgrace on his (Hague’s) part and it’s a slur on this country. The British side has officially informed us on their decision to deny permission for acceptance of the Medal of Ushakov by British heroes of the Arctic Convoys citing the ‘five-year principle’ applied to service toward a foreign country. ‘This decision gives us grounds for deep regret. ‘We consider such rationale cannot serve the basis for a refusal to recognise the heroic service of the British convoy veterans. ‘We hope that the British authorities will reconsider this bureaucratic formality and review their position.